An update of a previous research note. The method described here is based on common practices for measuring the height of a tree with a clinometer. Smartphone Option: Spirit level or (in)clinometer apps can be downloaded for free on most smartphones. 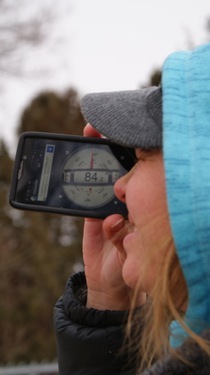 Clinometer Option: Works on its own. Clinometer & Ruler Option: A ruler may be helpful to use as a straight edge with your clinometer. By looking down the ruler’s edge while it is attached to the clinometers, you may be able to more easily record your angle of elevation. Level & Ruler Option: If you have neither a smartphone nor a clinometer, you will need a level that reads angles. You can also use a ruler as a straight edge to make sure your angles are correct. If you’re using a level app on your phone, check the calibration of the smart phone level against a real spirit level. On a shelf that you’ve checked to be perfectly level with a real spirit level, place your smartphone on its side, then ‘zero’ it (calibrating will usually be an option in the menu, depending on the app). 2a. The distance from where you stand to the highest point of the pile (or where you measure your angle of elevation). Again, make sure from where you stand you can see the top of the pile. You may not be able to measure your distance to the top of the pile on-site, but don’t worry, this can be done using Google Maps after you have created a balloon map of the area. *If you have an Android phone, you can download an app called Share My Position. This app gives you an exact readout of your latitude and longitude to be used later. There are comparable apps for iPhones. 2b. The angle of elevation from your eye to the top of the pile. Take this measurement from the same spot where you can clearly see the top of the pile. While you stand and measure this angle (looking down the long edge of your level directly at the top of the pile), your partner should read the angle given by the level for the most accurate reading. 2c. The height of your eye above the ground. Use a tape measure to record not your height, but the distance from your eye (where the clinometer or level is) to the ground. IMPORTANT NOTE: These measurements work assuming there is not an elevation change between you and the pile. If possible, stand in an area without an elevation change. If you are unsure if there is an elevation change, use Google Earth later to measure your distance from the pile and check for an elevation change. If you can see the bottom of the pile clearly, there is a way to work around possible elevation changes. Measure not only the angle from your eye to the top of the pile, but also the angle from your eye to the base of the pile (again, this will only work if the bottom of the pile is also visible). Step 3: Take pictures of the shape of the pile. These will help you later to better estimate the shape. You’ll use some simple trigonometry to calculate the height of the pile. All you need is the measurements taken above and a calculator. Make sure your calculator is set to degrees, not radians. If you do not have a calculator that has a Tangent (or Tan) button, use something such as Google’s online calculator. Once the balloon map has been constructed, the map can be overlaid on Google Earth, where distances can be measured. The width and area of the pile can be measured from the balloon map. Depending on the shape of the pile, different measurements may need to be taken to determine the area. 6a. Look up the angle of repose (or the steepest angle at which a sloped surface is formed from loose material). If the material is the same all the way through, you may be able to find the angle of repose online, for example the angle for repose for petcoke is 35 degrees. 6b. Use this stockpile calculator (http://www.arthon.com/calculators/stockpile.shtml) to estimate the volume of stockpiles. After you have the volume of the pile, weight can be calculated by multiplying volume by the weight per cubic foot. For mixed debris, FEMA has a brochure called ‘Debris Estimating Field Guide’ from September 2010 that details volume/weight estimations.